He was born Nov. 25, 1937, in Orange, Orange County, Calif., and was the first of four children to Oscar JB Nowlin and Dorothy Odessa (Longsdorff) Nowlin. John’s family moved from California to Oregon, where his father was taking additional training in the Army. Then when his Dad went to serve his country in the Pacific Theater of World War II, the family moved to Maroa, Ill., to stay with family members. After his father returned from serving in the Army, the family moved in January 1946 to Holton, where his father purchased the Holton Greenhouse, a business his father would operate for more than 50 years. John attended Central Grade School in Holton and was a graduate of Holton High School, Class of 1956. 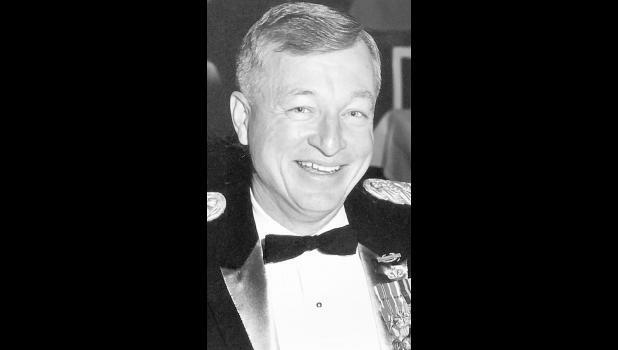 John joined the Kansas National Guard while still in high school and went on to join the Reserve Officer Candidate School at The University of Kansas, from which he graduated in 1960. Upon graduation from KU, John entered active duty service in the U.S. Army as an officer. He served with distinction on active duty for 28 years and his duty stations included Fort Gordon, Ga.; Fort Riley; Fort Leavenworth; Command Staff College, McDill AFB in Florida; Vietnam (two tours); Korea; Panama; and Germany. His service concluded when he was appointed as the Army’s liaison to the Minnesota National Guard. He completed his service with the rank of Lieutenant Colonel. After John completed his military service, he moved to California and worked with a cousin on various real estate projects. He later served on the Bellflower Planning Commission and was honored to chair that committee. He volunteered in collaboration with the Bellflower school district to organize an annual juried art show, an activity he thoroughly enjoyed. He was an avid train buff. He was an active member of MOAA (Military Officers Association of America) and a member of the Blaisdell Family National Association, a genealogy organization the roots of which (including John’s ancestry) can be traced back to 1635 in Pemaquid Point, Maine. John and his first wife, Lois Kay Johnson, whom he married Jan. 28, 1965 in Lawrence, were the parents of two sons, Steven Wade Nowlin (now known as Steven Walvig) and Jonathan Blaisdell “JJ” Nowlin. Lois and John later divorced. John subsequently married Lea Ruth (Pigg) Myles on Feb. 14, 1994 in Beverly Hills, Calif.
John is predeceased by his parents and is survived by his first wife, Lois Kay Nowlin, St. Paul, Minn.; his second wife, Lea Myles, of the home; his two sons, Jonathan (Jennifer) Nowlin, Plymouth, Minn., and Steven (Tasha) Walvig, Minneapolis, Minn.; two brothers, Stewart (Nancy) Nowlin, Lawrence, and David (Sharon) Nowlin, Overland Park; a sister, Mary Nowlin, Phoenix, Ariz.; a stepdaughter, Sandy Farrow, Carlsbad, Calif.; and a stepson, Randy McCray, Bellflower, Calif. He is also survived by four grandchildren: Evan Blaisdell Nowlin, Nigel Dugan Nowlin, Gerik Theirs Nowlin and Tabitha Rose Walvig. As is often said of John, “He was the greatest man I ever knew.” John will long be remembered for his engaging smile, helpful spirit, sense of justice, his uncanny sense of direction and always being just a little late to things, and most importantly for the kindness and love he generously shared with the world. As a father, brother, husband, uncle, grandfather, and to everyone who had the opportunity to know John, he will be remembered as a genuine friend and will be greatly missed. Services and burial will be held at 11 a.m. Friday, March 22 at Riverside National Cemetery, in Riverside, Calif., where John will be laid to rest with full military honors.